Water entering your chimney system or water penetration is the biggest cause of chimney deterioration and can cause major damage to walls, joists and the living areas inside your home. Water entering your chimney can leak out into the walls of your home and start mould build up inside the walls, which can lead to health problems. Masonry Chimneys are built of brick, stone and concrete. Many people tend to think that water can't penetrate through a masonry chimney. This is not true. water can leak through your chimney system in either one of the four areas described below. Click on the buttons below to see the four main causes of damp on chimneys. Rain is able to fall directly into chimneys without any covering on them. 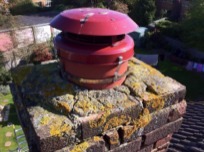 A chimney cover not only keeps the rain out, but also birds, animals and debris too. Install the correct cowl to all pots. There are many different types of cowl to consider depending on what the chimney is used for. Gas fires, open fires, stoves, disused chimneys etc. We at Wessex Chimneys are specialists in installing cowls, and can make sure that you have the correct cowl for your chimney. It is also important to make sure that flues that are no longer in use (most commonly the bedroom fireplaces) are capped off and vented in the room. This prevents rain entering the flue whilst still allowing a small flow of air up the chimney, helping to dry out any moisture inside the chimney. Because this layer of mortar slowly soaks up water when it gets wet, it is prone to developing small cracks through the freeze-thaw effect, where it freezes at night and thaws out in the day. The constant expansion and contraction causes the mortar to crack over time allowing water to soak through and into the chimney. Repair small cracks and seal the flaunching to prevent water from soaking into the cement. Where there are larger cracks and parts of the flaunching are loose, it is best practice to remove all the old loose cement and re-flaunch the top of the stack with a waterproof additive in the mix. This allows the rainwater to run straight off the top of the stack. Over time the lead flashing that is attached to the chimney can come loose, allowing water to track behind the lead flashing and into the house. Repair and re-point any parts of the flashing that are loose, making sure that it is sealed into the chimney all the way round. If the flashing is damaged, it may need to be replaced. You may not be aware that bricks slowly soak up water like a sponge. 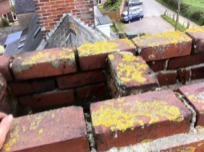 Due to this, one of the most common problems associated with dampness around chimneys is penetration via the brickwork / masonry. Rainwater can be absorbed into the stack above the lead flashing and percolates down through the masonry and past where the flashing sits into the chimney. This has become more apparent of late owing to changes of living standards and building design. Airflow within domestic dwellings is reduced, flues have been blocked off and the loft area on conventional houses is often converted into living space. This restricts the natural drying process of the chimney. All of these factors can make this problem worse and more noticeable. Adding to these are the longer periods of wet weather we seem to be experiencing and fireplaces not being used as much, all contributing towards preventing the bricks from being able to dry out sufficiently before they become saturated again. On newer properties this problem has been solved with the introduction of DPC trays (a large lead sheet separating the external and internal sections of the chimney) which catch any water that has got into the chimney and provide a route back out and onto the roof. To put a new DPC tray into an existing chimney will involve scaffolding the chimney, taking the chimney down to the roof line, putting in the new DPC tray and then rebuilding the chimney. This is the best way to solve damp problems caused by old chimneys, but not the kindest to your wallet. 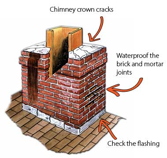 Apply a waterproof sealant to the external parts of the chimney to prevent water from soaking into the chimney. There are many different types of masonry sealer available, most of which are not suitable for chimneys as they block the pores in the bricks/masonry preventing the chimney from allowing internal moisture out. We only use sealant that is based on proven silane/siloxane technology and works by lining the pores of the masonry rather than blocking them - allowing the chimney to continue to breathe. This is in contrast to many standard brick sealer and stone sealer products which coat the masonry with a thin film. Stormdry is a deeply penetrating water repellent cream for brick, stone, and concrete. Due to its cream-based formulation it is able to penetrate more deeply into masonry than standard liquid-applied water seal products. Stormdry does not affect the appearance of the brickwork on your chimney. This is a premium product that is designed to last 20-30 years. Raincheck Plus does not block the pores of the substrate or affect the natural finish of the substrate (although some darkening may appear). Because it is alkali-resistant, Raincheck Plus can be used on freshly-repointed masonry. Raincheck Plus is based on an optimised blend of silanes and siloxanes. For this reason it benefits from enhanced UV resistance, resulting in longer life expectancy. We are more than happy to discuss what solution would work best for your damp problem, so please give us a call.